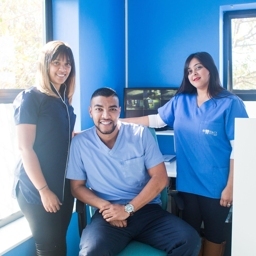 Here at Muller's Dental Studio in Cape Town, we endeavour to provide high-quality dental care and first class service in our local, friendly, community-focused Dental Practice. supported by an efficient, highly focused and friendly dental team, we offer flexible opening times and a range of dental treatments for you and your family. our staff are always keen to give new and existing patients a warm and friendly welcome. I was very pleased with the professionalism of the staff and the Doctor. I will definitely be going back in the future. Thanks for the great service. I haven't experienced any more warm and friendly hearts than Dr Muller and his team. Dr Muller made my first tooth extraction a very pleasant experience. I felt no pain at all. Lovely team - very friendly & welcoming. Will definitely be back. Dr Muller is calm, friendly and puts the kids immediately at ease. He's done such a great job on their teeth. Friendly and efficient. An overall good experience. Will recommend this practice to others. Dr Muller is amazing. I have high maintenance teeth and have lived in 6 countries visiting lots of dentists and I have honestly never been more impressed than today. I came to the doctor yesterday after 3 weeks of walking around with fallen front crown due to my previous doctor's lack of communication and proactive attitude. I saw doctor Muller yesterday and today I had surgically removed root and temporary crown ready and good to use! All in 1 day at a reasonable price and outstanding manner. Just wow and big thank you!